Freudenberg Sealing Technologies' Hygienic Usit sealing washer with NOVOnox hygienic screw and nut from Kipp Werke. Freudenberg Sealing Technologies (FST), has released its Hygienic Usit EHEDG-compliant sealing washers, for hygienically demanding open processes in the food and beverage sector. 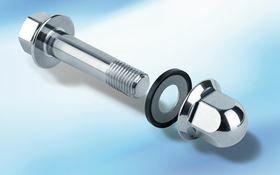 The company says that by using Hygienic Usit sealing washers in combination with special NOVOnox screws and cover nuts from KIPP Werke, entire screw connections are achievable in line with hygienic design principles. All open areas in the food and beverage industry must be intensively cleaned and sterilised in accordance with the relevant hygiene standards. Open Plant Cleaning (OPC) processes must ensure that screw connections within the equipment are protected from contaminant adhesion and any consequent microbial exposure. Hygienic Usit EHEDG-compliant washers comprise a flat metal gasket with a vulcanized trapezoidal elastomer bead that forms a dead-space freeform closure with the screw’s flange seat. The hexagonal screw with flange and the flange cover nut are polished to a high-gloss finish with a maximum roughness of just Ra < 0.8 μm. The screws are produced without sharp ridges, die marks or uneven head contacts. Along with the Hygienic Usit, the screw ensures a completely sealed screw connection, avoiding the adhesion or penetration of impurities. The Hygienic Usit is available from Dichtomatik UK.